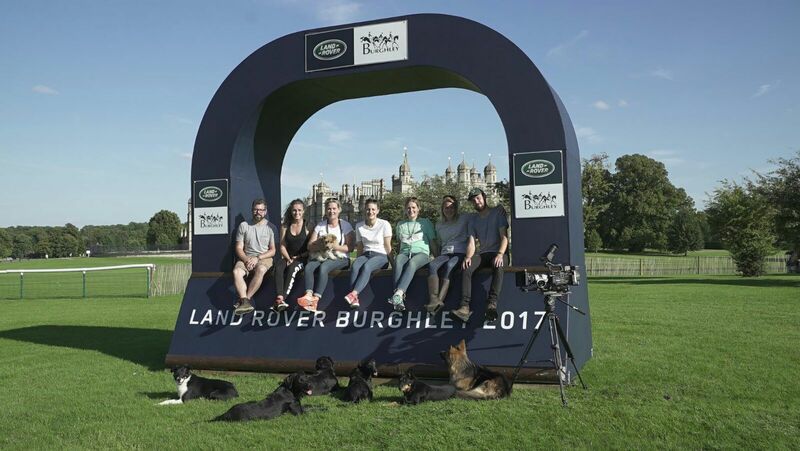 Heel, hup and hurdle – paw powered pathfinders were the first on course to tackle Captain Mark Phillips’ four-star cross-country track at this year’s Land Rover Burghley Horse Trials. With fences reaching up to 1.40 metres high and stretching two metres wide, the dogs made light work of the challenge, showing-off their scope, speed and agility. Watching the film, it’s maybe easy to forget about the team behind the camera lens, who had a tough job keeping up with the dogs. To find out more about the action behind the scenes, we put our EP Production Manager, Kathy Stringer, in the hot seat. How was the idea of Dogs Do Burghley formed? Earlier this year the fab team at CAA, Burghley’s PR and marketing agency, said they would love to take on the parkour runner film we made for them last year, showing the Burghley cross-country course in a different way. They thought agility dogs could be a great way to show this, and we loved the idea from day one. It was just a case of turning a great idea into a film which worked. In the film there are no humans in sight, how did you manage this? It wasn’t easy!! We had to suss out lots of clever camera angles so the dog trainer, Ellena Swift, was not in shot, even though she was with them at all times. Admittedly, there were a few edits needed to cut out the odd arm or leg. The team were all so impressed with Ellena and the dogs who behaved impeccably, especially when they had to sit patiently off-camera and watch their canine friends perform a take. It was a great shoot, lots of fun was had. How did you plan for this, with seven dogs, thirty-one obstacles, across 6500 metres of parkland, surely there was a fair amount of improvisation on the day? First up we walked the course, to prepare a plan for each fence, it was a very wet day but it proved incredibly helpful in getting everything prepped properly. On the day of filming, with glorious weather, we gave a time allowance for each fence and at some points we had two groups on different fences to help speed up the process and keep the dogs full of energy. It all worked out really well, we just had to keep things moving. What was most likely to go wrong, and did it? Time pressure, losing the sun and the rain. In particular, some of the jumps had become wet and slippery which meant they were unsuitable for jumping on so instead we opted for a ducking or weaving approach!! Ellena Swift’s dogs were phenomenal and made the four-star track look like a walk in the park, were there any fences they found particularly challenging? No, they were absolutely fab. There wasn’t a lead, collar or whistle in sight. A highlight of the film has to be Fence 16ab – the Land Rover Dairy Farm. At 1.40 metres high, on an uphill approach, this is an impressive feat for the three Labradors (and William). How many takes did you need for this? One, it was a bit of a fluke!! Jack Russell William had a few ideas of his own, including some sneaky detours – how did he cope against the ‘big boys’? William was the leader of the pack and his quirky character kept up the laughs. He had his own style of jumping and on most fences was lifted on and off by owner Debbie Lee – apart from Fence 33, the Picnic Table where he pinged off all by himself. One of the highlights has to be William sitting in his bed at Fence 29ab, the FEI Classics Leaf Pit, just watching smugly as the other dogs sprint past. Overall, it was incredibly special to watch the relationship between Ellena and her dogs, the trust and love was evident. Of course it was also brilliant to see how well the film went down once we’d put it through edit. The Facebook comments were amazing – thousands of shares and likes and it’s had almost 400k views to this point which is absolutely fab.